derecho opus dei, libro fascista. cae la gota, cae la bolsa, la toma se toma la maquina rota. la calle no calla, de bate que esta. Como tu todos, semilla, pascuala, métodos y coros. tu politica y tu riqueza y tu tesoro no. Golpe a golpe, beso a beso. todo este fallo, todo este económico modelo condenado de dinosaurio. todo se quita, todo se pisa, todo seficha y clasifica. tu típica risa y ética. tu política y tu riqueza, y tu tesoro no. La hora sonó, la hora sonó. millions from pole to pole! with the conviction that THE THIEVING STOPS!! fat slices, powerful decisions for very little. opus dei rights, fascist books. the drop falls, the stocks fall, the occupation takes the broken machine. the street doesn’t keep quiet, as wide as it is. I eat you all, seed, (pascuala? ), methods and choruses. millions from pole to pole!! with memory and with the history of the future, it’s NOW! everything: this failure, everything: this condemned economic model from dinosaur times. they get rid of everything, walk all over everything, open a file on everything and classify it. your typical smile and ethics. How many of them were silenced? cops, hoses, DON’T ADD UP. How many were those who stole the fortunes? Police offering drugs to Occupy Minneapolis? via ishtarmuz vodpods Decalz Lockerz. Springtime for Occupy: Movement’s Plans For Coming Weeks and Months. It’s shaping up to be a busy spring for Occupy. The movement born last year in a New York City park has come roaring back to life this week after a period of hibernation. It promises to be even livelier in weeks and months to come. On Monday, according to the Sacramento Bee, a crowd numbering in the thousands, including Occupy protesters, converged on California’s capital to denounce soaring college tuition costs. Chanting “You’ll hear us out, or we’ll vote you out,” they tried to occupy the capitol rotunda. Some succeeded. In what the Bee called “a massive show of force,” 100 California Highway Patrol officers arrested 68. Occupy is taking credit for the White House’s recent decision to move a May meeting G-8 leaders from Chicago, where Occupy and other groups had threatened protests, to safer and more remote Camp David. “We scored a victory, forcing them to retreat to the back woods of Maryland,” Andy Thayer, Occupier and spokesperson for the Coalition Against NATO/G-8, tells ABC News. 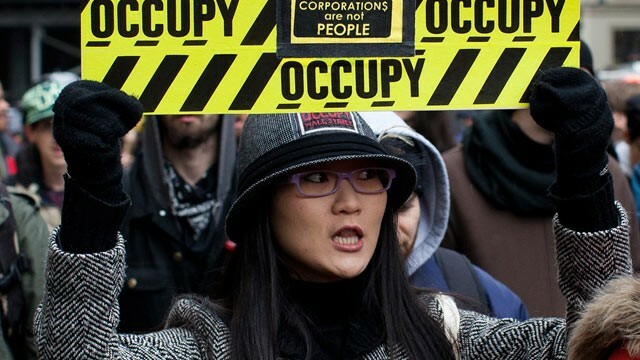 All around the U.S., other Occupy actions are in the works. Next week Occupy St. Louis will host a Midwestern conference of regional Occupy groups, where Thayer will speak. In Manhattan, veterans of the original Occupy Wall Street have just returned from a five-week bus tour of 12 Northeaster cities, where they met with counterparts to exchange ideas, network and offer seminars on such practicalities as how to organize a march. “It was pretty cool,” says Occupier Pete Dutrow, who says he has been “pretty much a full-time activist” since the Occupy movement started. He was a member of the Finance Working Group in and has now moved on to other projects. Regarding money, Occupiers should start to get support later this month from a new entity called the Resource Movement Group (RMG), bankrolled by wealthy supporters sympathetic to the movement. The backers include Ben Cohen and Jerry Greenfield of ice cream maker Ben & Jerry’s, as well as Danny Goldberg, former manager of Nirvana. Their goal is to raise $1.8 million, to be given out as grants of up to $25,000 each to protesters whose projects win RMG’s approval. On April 28, Occupy Cleveland will kick off a celebratory event called Occupy The HeartFest, which will serve as a kind of warm-up for the NATO protests in Chicago and for a nationwide General Strike planned for May 1st. The May Day General Strike calls for workers and students around the country not to show up for work or school. The idea, say organizers, will be to show the “1 percent” what life without the “99 percent” would look like. In New York City, Occupy Wall Street has discussed a morning disruption of commerce, followed by a mid-day demonstration in support of immigrant rights, capped off by an evening march. On May 9, Bank of America shareholders will hold their annual meeting in Charlotte, N.C. They’ll have company. Occupy’s protest plans for the meeting are in flux, but organizers view it as an opportunity to agitate against BofA’s and other banks’ home foreclosures.